After a rocky Daytona qualifying session earlier this year which saw Clint Bowyer, Denny Hamlin, J.J. Yeley and others involved in a wreck, NASCAR has revised its qualifying format for the remaining superspeedway races at Talladega and Daytona. The revised format will be welcome with open arms by most drivers, including Hendrick Motorsports’ Jimmie Johnson. Under the new rules, drivers will participate in two rounds of single-car qualifying, with the top-12 posted lap speeds advancing to the second round. The qualifying order for the first round will be determined through a random draw, while the final round qualifying order will ordered by the slowest to fastest drivers from the first round. 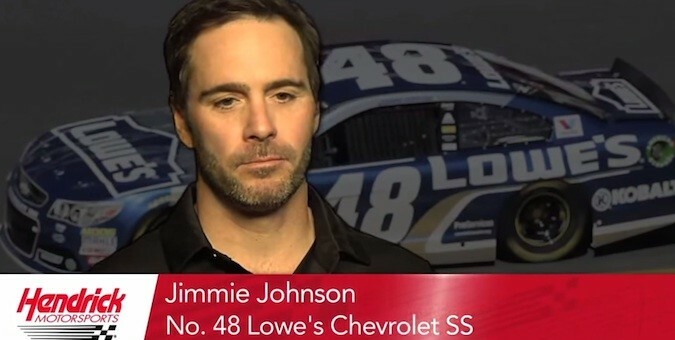 Hendrick caught up with Jimmie Johnson for an interview to see what he thinks of the changes for the Talladega weekend. The six-time Sprint Cup champ is happy teams won’t be totaling racecars with the new single-car format, a feeling he shares with many other drivers and race fans. Check out thr interview below ahead of NASCAR Sprint Cup qualifying in Talladega tomorrow afternoon at 1 p.m. ET.